Weather remains terrible so I have gone back on some old data. The above image is formed of 7 separate images stacked in PixInsight and then some key Milky Way features annotated. 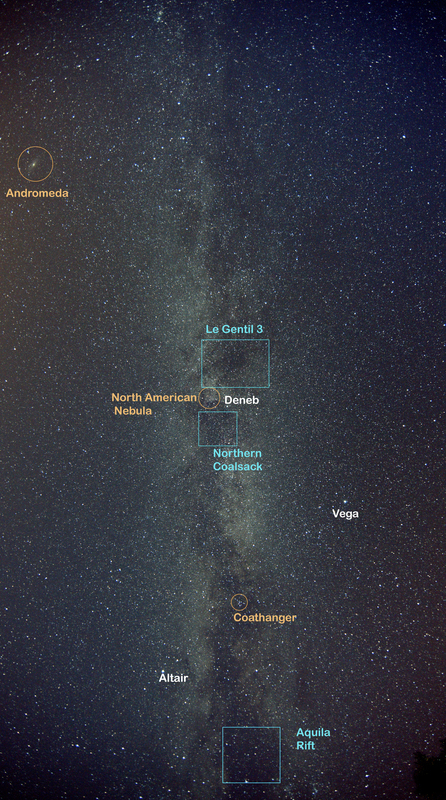 The Summer Triangle comprises the 3 bright stars: Deneb, Vega and Altair. The North American Nebula is a hydrogen alpha emission zone. The Coathanger is an asterism that looks like an upside down Coathanger- its official name is Collinder 399. I’ve always liked dark nebulae – dust and molecular clouds that obscure stars. I’ve marked in LeGentil 3, the Northern Coalsack and Aquila Rift. Canon 5d mark 2 with 14mm f2.8L lens at f2.8 and ISO 3200 -20 second exposures. Next time, I’ll try it with a hydrogen alpha enhanced camera and try pushing up to about 30 seconds exposure. Quite a lot of coma with this lens at the periphery.